640 m2 of shop experience. The shop starts on the street. The range is much broader than clothing and shoes alone. It is a delight to come into Mantje’s shop. And a delight for the retail designers to create a wonderful interior concept for Mantje. How many floors does Mantje have? The basement is a real man-cave, displaying men’s fashion, men’s gloves and jeans. The ground floor is the domain of the ladies, with fashion, shoes and outdoor items. 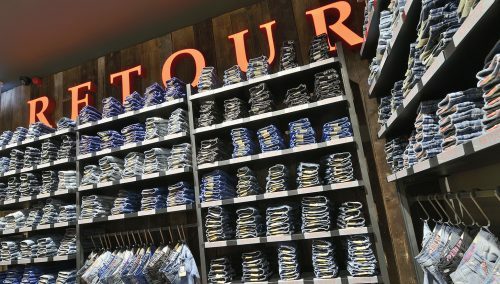 On the first floor, the gents can find their outdoor items, and children are welcome to pick their favourite shoes and clothing. On the second floor, we offer home products and specialities for ladies, including amazing home accessories. The home products are new in Mantje’s collection! Lift your fashion concept to a higher platform by adopting a Lifestyle Concept? 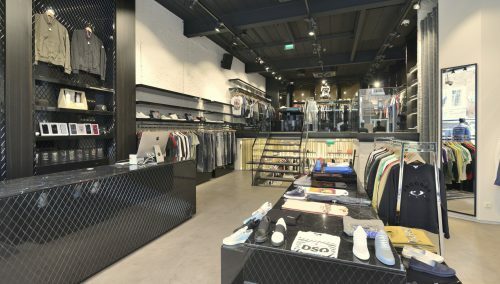 WSB Interior Construction provides Retail design and turn-key store concepts for clothing shops, fashion labels, fashion shops and children’s clothing shops. Building a clothing shop is a result of extensive preparations. The WSB project managers will team up with you to find a concept that matches your customer group and strategy. Every business has a different customer group, concept and look and feel. That is why WSB’s starting points vary. This personal approach allows for a wide diversity in shop interiors in projects delivered. This is the jewel in the new store in De Koog: the rescue boat Ida Mary. With its proud place in the mezzanine, the vessel is the figurehead of Mantje lifestyle Stores in the seaside resort. The Ida Mary is a gift received from Mrs Huet, of Huet and Pierson. The rescue boat was christened Ida Mary as a remembrance of her grand daughter with the same name, who died young. The Ida Mary served as a rescue vessel on the island of Texel from 1964 to 1986. The well-known Texel beach comber Maarten Boon returned the vessel to Texel in 2011, after having been out of service for quite a while. He intended to refurbish the ship and take tourists out to sea. His health condition deteriorated and the rescue boat went up for sale. A number Texel residents, including Sandor Mantje, came up with a special plan to preserve the boat for the island: the Ida Mary Foundation. The plan was to have the boat serve as the centerpiece of a maritime exhibition, but that was not feasible. “I have a personal thing with this boat. So we decided to display it in the new store. Corry Boon, the widow of Maarten Boon, thinks it is wonderful that the Ida Mary was preserved for Texel in this way. “It was Maarten’s last wish, and now it came true”. WSB creates many high-end fashion stores with the right experience. 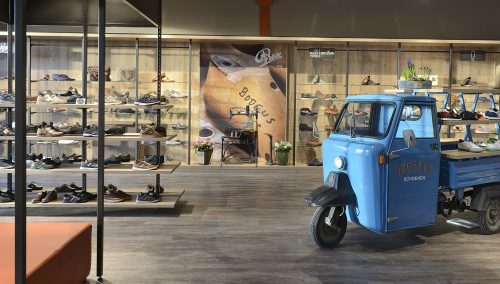 We work for Kings-square, Beachim and Brunello Cucinelli, and for Snoeren Schoenen. These fashion and shoe stores operate in the mid to high segments. Customers that come into their doors are looking for personalisation in fashion, luxury and exclusivity. This feeling must emanate from the brand range, but also from the shop itself. High-end materials such as marble and black lacquered veneer are a perfect choice. Still, the shops in this segment all have a unique look. That makes sense, because each shop has a different target group and service area. These elements are factored into the interior design. The WSB designers translate feeling and emotions into a unique fashion shop interior design. This will make your clothing shop a commercial success this way. Our designers travel frequently to various leading cities throughout the world, they are aware of the latest trends and developments in the shop interiors sector.